The signup and approval process is very simple.There is no limitation based on traffic.So new website owners with little traffic can also use this advertising network. Anchor Ad — Let’s say that you have opened your website powered by Dynamic Oxygen then the anchor ads are placed at the bottom of the window.These ads are not part of your page but are displayed on top of it.If you close the ad then your webpage portion under the ad is displayed.Since these ads are place at bottom of browser window so these ads are visitor friendly and have high click rate. Cursor Ad — Cursor ads are displayed at the cursor position of visitor on your website.It is displayed on top of your webpage.User have to close the ad.The ad follows the cursor if visitor moves the cursor on webpage.This ad type can be annoying but has very high click rate if the ads are relevant to the visitor. Floating Ad — Floating ads are displayed at the right hand center side of your website.It is displayed on top of your webpage.This ad type is better than the banner ads displayed on sidebars of website as visitor can close the ad and you have more space on sidebars to put content. Interstitial Ad — Interstitial ads are displayed for few seconds (or visitor have to close it) before your webpage is displayed to the user.For example if someone enters url of your website then this ad will be displayed for few seconds and after that your webpage gets loaded.Choose this type if you are not too dependent on search engine for your traffic.Search engine visitors may not like waiting and closing an ad before getting to searched content. Layer Ad — Layer ads are displayed in middle of your webpage.These ads are not part of your page but are displayed on top of it.If you close the ad then your webpage portion under the ad is displayed.The size of ad box is approx 500*500.So it covers only center part of your website.It is good ad format to display on your site and has good click rate but the drawback is your site average time decreases.You may also loose a regular follower of your blog if the user has come through search engine or randomly visited your site. Message Ad — Message ads are displayed at bottom right corner of your webpage.These ads are not part of your page but are displayed on top of it.The size of ad box is approx 250*50.So it covers only small part of your webpage.It is good ad format to display on your site.It is one of the most user friendly ads of all. Sky Ad — Sky ads are displayed at top portion of your webpage window.They are one of the best ad formats and also have high click rate.The ads cover the header portion of your site so content area is visible to the user.User can close the ad to see the header portion else can read through the website normally.This ad type beats the banners on header area.You can keep your header area clean and make money with Sky ads.One of the best ad formats. Pop up and Pop under ads are also offered by Dynamic Oxygen. Minimum payment threshold of Dynamic Oxygen is $50.Payment is made through Paypal,Check and Wire transfer.Payment is net45 so if you reached $50 in month of January you will be paid in Mid March. Dynamic Oxygen ads can be used along side Adsense.But it is not adviced to use it along with Adsense (no compatibility issue but Adsense earnings may drop). Dynamic Oxygen does offer referral program.You can earn 5% of your referral earning for life. The Dashboard is pretty simple and easy to use.May be they can work a little on reports section of Dashboard.The ad code generation and site addition sections are pretty well. How to add Dynamic Oxygen ads on your website? 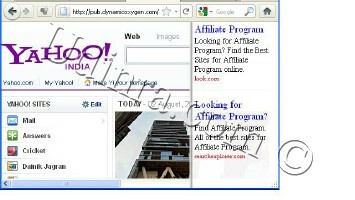 Easiest way to add Dynamic Oxygen ads is using plugins offered by Dynamic oxygen.It is free and can be downloaded from their website.In case you are using WordPress then you can use Udinra Adsense Alternatives plugin to add Dynamic Oxygen ads to your website.The ad code does not slow down your website. Dynamic Oxygen displays ads only to search engine traffic.So your direct traffic and referral trafic goes in vain.High payment threshold for a new advertising network does not work well. Dynamic Oxygen does display ads to Indian traffic as well.According to their website traffic from all countries are accepted.But they do not offer good eCPM. Avoid this company like the plague – service is shocking and non-existent and staff attitude is disgusting. how can i submit ad code in my blog….i submited but don’t work..plz give me a solution. I Really Wanted To Know About It! Do They Pay Through Check In India, Without Any Problem?